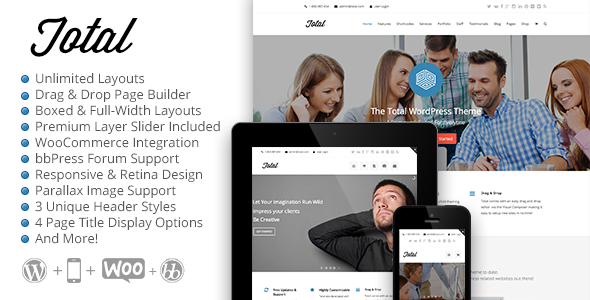 Total is a clean, modern and responsive WordPress theme designed to be customized. The theme was created with many different niches and professions in mind � bloggers, online stores, lawyers, agencies, wedding planners, hosting companies, nonprofits and more. Just have a look at some of our industry specific homepage examples to get an idea of just what kind of magic Total is capable of. The theme is packed to the brim with great features like WooCommerce integration or Unlimited Portfolios. At a price that is less than a tank of gas there�s no reason not to get Total today and start building your new website! Create any page layout using the extended Visual Composer plugin for WordPress. We�ve added our own custom Visual Composer Extension plugin adding tons more drag and drop modules to make Total more comprehensive & complete (aka the Total package). 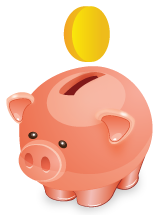 We�ve tried to include a lot of features to make Total that much more flexible. Keep a lookout though � we�ll be adding in even more useful features as soon as we can.